The computer world is growing fast and to keep up it becomes necessary to update your router firmware periodically. This guide covers the basics of why and how to update your router firmware. Software is normally referred to as add-ons such as programs you run on your electronic device. Firmware acts as the foundation upon which your router runs. This is somewhat permanent in that it can't be changed until a new firmware update replaces it. It also can't be removed like you can with software. Don't update your firmware unless you think it is necessary. A firmware update can be somewhat dangerous if you don't take the right precautions. If the update is interrupted at any point during the process, your router could become useless. This becomes a much smaller risk when a cable is connected directly from the router to the computer you will be using to update the firmware. A cabled computer has a more stable connection to the internet during the update process. Most devices come from the manufacturer with problems or bugs that cause issues with performance. Once the bug is found, a remedy is created usually in the form of a firmware update. If your router is slow or even freezes. A firmware update could be the solution instead of throwing it away and buying a new one. Sometimes a firmware update adds new features to your router such as a guest network, traffic meters, or parental controls. By checking the manufacturers website periodically you can be up-to-date on the latest options available to your router. Depending on when you bought your router you could be using a outdated version of security. Keeping an updated security version is crucial if you want your private data to remain private. We strongly recommend updating your firmware version if you are still using WEP or WPA security. Take a look at our WEP vs. WPA Guide for more information on why you shouldn't be using these security options anymore. If you are unsure what security type you are using, click the link on the left side of the page labeled List of Routers. Then using the green links near the top of the page. Click the WiFi Instructions option. Follow the steps on that new page to figure out what security options you have available to you. If you are not using WPA2 then you need to update your firmware to allow for this security type. 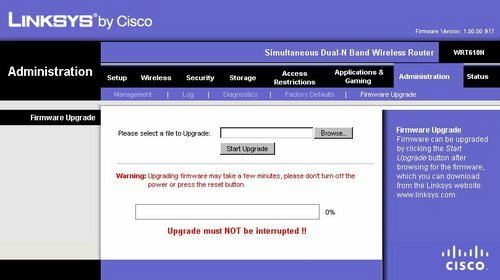 This is a basic guide that shows you how to update your router firmware. This particular guide is based on a very popular Linksys router. Most likely your router's interface will be different, but the following guide will help you understand the basic process. Use a computer that is wired to your router. Using a computer that is not wired to your router has an unreliable connection to the internet. You need a durable and steady connection because this update process can not be interrupted. An interruption could potentially cause your router to become useless. You need to find out what firmware version you are using. Most routers display this on the status page. It is typically called Firmware Version but in some cases it may be called something like Runtime Code Version. Go ahead and login to your router. You can find your router's login guide from the Home page of our site. If you have followed our login guide you should now be on the Home page of your router. This page should list the Firmware Version you are using and the model number. If you have never updated your firmware, you can find this information on the underside of your router. On the router we have chosen, the firmware version is located in the upper right corner of the page. Write the firmware version you are using and the router model number somewhere convenient. Once you have found the firmware version and model number, you need to visit your router manufacturer page. For this router, you will need to visit the Linksys support page. Be sure you are getting your firmware upgrades from the router's official website. Type your router's make and model in the web-browser, the manufacture's page should be the first or second choice. Locate your specific router's updates on the website. Go ahead and download the firmware version you want update. After you have downloaded the new firmware version to your computer, you need to save it to an easy to access place on your computer, such as your desktop. Find the Firmware Update Section of Your Router. If you logged out of your router before visiting your router manufacturer page you need to login once again. Once on the Home page of your router, you need to locate the Firmware Update page. For this router you click the option of Administration at the top of the page. Then beneath that click the option of Firmware Upgrade. 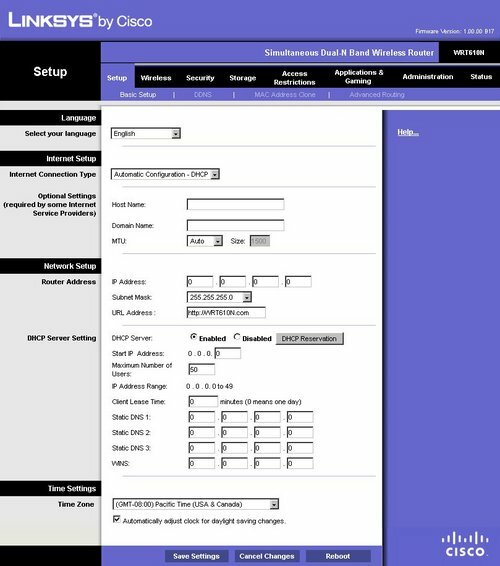 Some routers may have this page in the Maintenance or Tools section of the router. You should now be on the correct page to update your firmware version. Use the Browse button to locate the firmware version on your computer. Once you have located the correct file, highlight it and click the option of Open. The file you have chosen should now be in the Please select a file to Upgrade box. Click the option titled Start Upgrade. Your router should reboot after the firmware update is complete. If your router did not reboot, check the router status page to see if the firmware version has changed to the version you chose. Do not unplug your router or interrupt this update. Interrupting this update could cause damage to your router.